Seems like J. Robert Parks is seeing all of the great films this year, while I sit and wait for them to show in Seattle… Here he goes again, raving about another must-see: The Edukators. The month of August is not usually a banner month for cinema. Hollywood will release some of its worst films in the next few weeks, assuming that most people are either on vacation or getting ready for school and, therefore, aren’t going to the movies anyway. But in Chicago at least, these last weeks of summer are shaping up as some of the best in recent memory, at least for those of us who know our way to the arthouse theaters. 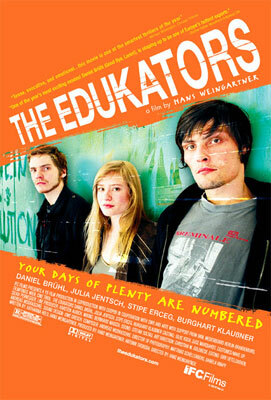 It kicks off with a small German film called The Edukators, which opens this Friday at the Landmark theater. Directed by an Austrian filmmaker named Hans Weingartner, it stars Daniel Bruhl (Goodbye, Lenin!) as a young man named Jan. He and his friend Peter (newcomer Stipe Erceg) fashion themselves as anti-capitalist activists. Their main mode of protest is sneaking into the homes of rich people who are on vacation. There, Jan and Peter rearrange the furniture, often stacking it in big piles, and leave notes with ominous messages like “Your days of plenty are numbered.” It turns out that Peter is dating a pretty woman named Jule (Julia Jentsch, Downfall), who’s not as politically oriented, in part because she’s too busy working–“You create endless debts, so you need a career to pay for them.” But when Peter goes to Barcelona for a vacation himself, Jan and Jule start hanging out. One night, she convinces Jan to help her break into the house of a man named Hardenberg. She hit his expensive Mercedes the year before and is still paying for the damages. Jan’s nervous at first, and his fears are confirmed when Jule discovers afterward that she left her cell phone in the house. When they go back to retrieve it, they’re interrupted by a returning Hardenberg. A confrontation ensues, and Jan ends up clubbing the older man on the head. They panic, call Peter (who’s just returned), and decide to kidnap the man and flee to the mountains. But what should they do there? At first, they think of making their kidnapping public and issuing various manifestoes. But talk soon turns to the practical issues of milk and toilet paper. Then there’s also the touchy subject of Jule. It slowly dawns on Peter that things have changed since he was away. One of the many great things about The Edukators is how Weingartner sets up the rhythm of these relationships. He captures the way lovers snuggle together as well as the furtive glance that doesn’t go unnoticed. And even if you’re not terribly interested in the film’s politics, you won’t help but be fascinated by how the love triangle plays itself out. A number of critics have accused Weingartner of self-indulgence and political naivete, but I suspect those same people would rather have the dull, droning heads of documentaries like The Corporation. What The Edukators does so well is interrogate the difficulties of being a leftist in today’s capitalist society. The three would-be revolutionaries are clearly not effective on a larger scale or even in their own little spheres. Yet, the movie doesn’t patronize them with pats on the head or celebrate their lack of effectiveness. Instead, it asks, what’s the alternative? In a powerful night-time conversation, Hardenberg talks about how he participated in the ’68 protests. His captors are amazed and ask how he turned into a Mercedes-driving capitalist. The discussion that follows is both poignant and challenging. And when one character remarks, “What was considered subversive then, you can buy in shops today,” it’s hard not to think about how capitalism consumes almost every kind of opposition. I fully admit that part of my admiration for The Edukators is due to the issues it raises, and that someone who wasn’t as politically conscious or as interested in radical politics wouldn’t find it as interesting on that level (I would then suggest that such a person should see more political films to help rectify the problem). Yet, the movie also works as a simple relationship story. The growing romance between Jan and Jule in the film’s first half hour is detailed and captivating, as both actors delightfully convey the joie de vivre of early infatuation. The two bond over shared music and a weekend when they paint an apartment, and anyone who’s fallen in love will recognize themselves in these moments. But the film also explores and interrogates that old chestnut of the love triangle. It’s no accident that the names Jan and Jule echo Truffaut’s classic Jules and Jim, and Weingartner takes the same optimistic approach that Truffaut did while acknowledging (as Truffaut also did) the inevitable difficulties when two friends love the same woman. What makes The Edukators so brilliant is how the film integrates these personal themes with the larger political ideas. My friend Garth and I had a furious argument last spring over the Italian movie Best of Youth, which I asserted found a way to explore political issues through a personal lens (Garth found that approach “bourgeois”). The Edukators does the opposite–it finds a way to explore personal issues through a political lens, acknowledging that the two are rarely as separate as activists on both sides of the fence would have us believe. Thanks for posting that up Jeff. It came out here first and at the time felt like the best film I’d seen all year, I’m still weighing its final placing up, and may have the chance to see it again. FWIW I thought though that Jule was politically motivated (we see her at the demonstartion at the start) but she is just not part of The Edukators. Finally, JRobert if you’re out there, what didi you make of the ending? Say "Yes" to The Ragbirds - "Yes Nearby"